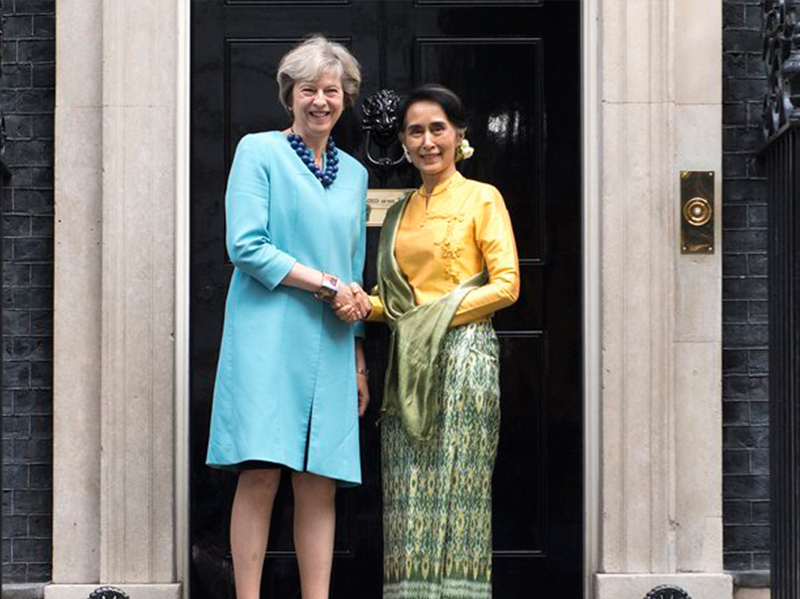 “The Prime Minister welcomed Burmese State Counsellor Aung San Suu Kyi to Downing Street today for bilateral discussions, in Aung San Suu Kyi’s first visit outside of Asia since her National League for Democracy party’s historic election victory in November 2015. The Prime Minister congratulated Aung San Suu Kyi on the progress made so far in Burma’s political transition after years of military dictatorship. Aung San Suu Kyi thanked the Prime Minister for Britain’s friendship and support. The Prime Minister said we stood ready to provide further assistance as Burma continues to develop, including through £118 million in support this year. They agreed that to create a society that truly works for all, it would be important to see Burma make further progress in the creation of jobs, in improving access to quality healthcare, and on reforming the education system. The Prime Minister raised concerns about human rights abuses in the Burmese military.